The Kingdom of Judah (Hebrew מַלְכוּת יְהוּדָה, Standard Hebrew Malkut Yəhuda) was the nation formed from the territories of the tribes of Judah, Simon, and Benjamin after the United Kingdom of Israel was divided. It was named after Judah, son of Jacob. The name Judah itself means Praise of God. It is thought to have occupied an area of about 1 E9 m²|8,900 km² (3,435 square miles), although its borders fluctuated. Map of the southern Levant, ca. 800 B.C.E. The territory of the Kingdom of Judah is colored burgundy. Judah is often referred to as the Southern Kingdom to distinguish it from the Northern Kingdom (the Kingdom of Israel) after the two entities divided. Its capital was Jerusalem. It endured as an independent kingdom, with intermittent periods of vassalage to foreign powers, from the reign of Rehoboam until the fall of Jerusalem to the Babylonians in 586 B.C.E. (See chart below). The main source of our knowledge about the Kingdom of Judah is the Hebrew Bible, especially the Books of Kings and Chronicles, as well as references to historical events in the writings of the Prophets. In several cases, documents left by non-Judean rulers provide addition information and alternative perspectives to those provided by the biblical writers. The biblical story of Judah and Israel is, for many people, the history of God's Providence. It also underlies the western view of history as a linear process (as opposed to an eternally repeating cycle) and provides the foundation for the idea of the historical struggle between the forces of good and evil. The Kingdom of Judah's foundation is traditionally dated to the point at which Israel and Judah divided, shortly after the reign of King Solomon, which ended in 931/922 B.C.E. However, it should be noted that King David had earlier been anointed king of Judah at Hebron (2 Sam 2:4). A period of civil war followed, with a unified kingdom emerging under the monarchy of David and Solomon, according to the biblical account. 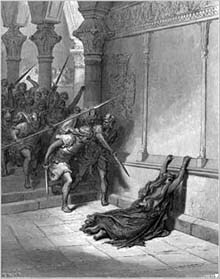 After the end of Solomon's reign, a dispute arose between his son, Rehoboam, and northern leader, Jeroboam, who had been a minister of forced labor under Solomon. Jeroboam urged the young king to relax the labor requirements that Solomon had imposed on the northern tribes, saying, "Your father put a heavy yoke on us, but now lighten the harsh labor and the heavy yoke he put on us, and we will serve you." Rehoboam harshly rejected the request, and the northern tribes revolted (2 Chronicles 10). While such may have been the political and economic realities, the author of Kings makes it clear that the root cause of the division was spiritual, resulting from King Solomon's sin of idolatry. The Southern Kingdom thereafter represented his better half, demonstrating a greater degree of faithfulness to God, while the Northern Kingdom fell into a consistent pattern of tolerating and practicing idolatry. Shortly after the schism, a raid of Shishak of Egypt forced Judah briefly into submission. Shishak's forces plundered both the city and the Temple but apparently did little lasting harm. For the next sixty years the kings of Judah aimed at re-establishing their authority over the other Israelite tribes. Judah's army gained limited success under brief reign of King Abijah (Abijam). However, the latter part of the reign of the next king, Asa, faced strong opposition by King Baasha of Israel. Asa then allied himself with the Aramean (Syrian) kingdom of Damascus. Nevertheless, before Asa's death (873/870 B.C.E. ), a lasting friendship was made with Israel, now under the new and powerful dynasty of Omri. A school of Yahwist prophets arose in opposition to this association, because of its corrupting effect on Judah's religious and moral purity. Nevertheless, Judah assumed a subordinate role politically until Israel was crushed by the invading Assyrians. During this time, Judah and Israel occasionally cooperated against their common enemies, especially the Syrian power centering on Damascus. Jehoshaphat (enthroned 873/870 B.C.E. ), the son of Asa, fought side by side with Ahab of Israel in the fateful battle of Ramoth-Gilead. Although praised by the the bible (I Kings 22:41-44) for commendable devotion to Yahweh, Jehoshaphat strengthened the alliance by marrying his son Jehoram to Athaliah, the daughter of Ahab and his Phoenician queen, Jezebel. Later, he collaborated with Israel in shipbuilding and trade. Jehoram succeeded his father, killing six of his own brothers to insure his reign. However, in the next generation, Jehoram's son Ahaziah, in league with the northern kingdom against Syria, was assassinated by the Yahwist zealot Jehu in the process of Jehu's usurpation of the throne of Israel. Ahaziah's mother, the aforementioned northern princess Athaliah, then carried out a bloody coup in Jerusalem, thus becoming the first and only ruling queen of Judah. Because of Athaliah's devotion to the Phoenician deity Baal, the priests of the Temple of Yahweh engineered a counter-coup against her, placing Jehoash, the young son of Ahaziah, on the throne. In the early days of Jehoash (enthroned 842/835 B.C.E. ), the Syrian king Hazael of Damascus ravaged the whole country up to and including the city of Jerusalem. The Syrian power soon declined, however, and Judah now began a period of prosperity, which finally made it one of the area's leading kingdoms. Jehoash's son Amaziah reconquered Edom, which had been lost under Jehoram. This secured a direct trade route to western Arabia, as well access to Red Sea trade through the Gulf of Aqaba. However, the king of Israel, Joash, perceived Amaziah's growing power as a threat and made war on Judah, capturing Amaziah, forcing the submission of Jerusalem, and pludering its temple. With the advent of Uzziah (ascended 788/767 B.C.E. ), the prosperity of Judah was renewed. Uzziah conquered much of the Philistine country and briefly brought even Moab to heel. He fortified Judah's towns, expanded its army, and successfully developed the country's natural resources. Jotham continued the vigorous regime of his father, following the example of the mighty kings of the powerful Assyrian empire. During the reign of Jotham's son Ahaz (beginning 742/732 B.C.E. ), the Assyrian empire came to the fore. The northern king, Pekah, allied with Rezin of Damascus in the face of the Assyrian threat. Ahaz refused to join the coalition; under pressure, he called for help from the Assyrians. 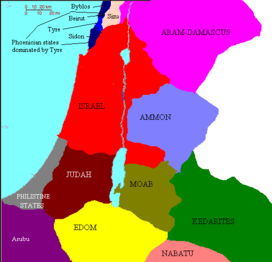 The Assyrians eventually annexed the northern half of Israel, and Damascus itself fell. Judah was spared, but it became a vassal state of Assyria. Hezekiah, son of Ahaz, is much praised by the biblical sources for enacting religious reforms that favored the Yahweh-only ethic of the Jerusalem priesthood and the prophet Isaiah. However, around 700 B.C.E., he unwisely joined in a military coalition against Assyria. Before the might of the Assyrian king Sennacherib, all of Judah's fortified cities fell, with the sole exception of Jerusalem. Many Judeans were deported, Jerusalem itself being spared when a plague broke out in the army of the invader. After Hezekiah died at a comparatively young age (697/687 B.C.E. ), the reign of his son, Manasseh, fared poorly. Manasseh relaxed the religious restrictions instituted by his father, and Judah remained the vassal of Assyria. The situation did not improve under Manasseh's son, Amon. In the early years of King Josiah (641/640 B.C.E. ), the priestly party regained the upper hand. The young king accepted as valid the newly discovered "Book of the Law" of Moses (2 Kings 22). A bloodly purge of non-Yahwist priests soon followed, and even sacrifices to the Israelite God we banned outside of Jerusalem's official temple. Josiah presented himself as God's champion, aiming to purge the nation of the moral and spiritual corruption that had infested it as a result of Canaanite influence. If Josiah was the new Moses, the Egyptian ruler Necho II was the present-day Pharaoh. Heading the revived monarchy of Egypt, Necho aimed to supplant Assyria as the dominant force in western Asia. When Necho passed through Palestine with an invading force c. 608, Josiah boldly offered him battle at Megiddo, and was slain. Jehoahaz, the second son of Josiah, reigned for three months, after which he was dethroned by Necho and exiled to Egypt. 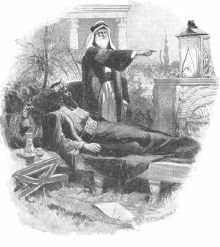 Josiah's eldest son, Eliakim, replaced him, ruling at Necho's pleasure as "Jehoiakim." Judah's vassalage to Egypt, however did not last long. In 607 B.C.E. Nineveh fell to the Medes, and much of the territory between Niniveh and the Mediterranean came under the new Babylonian monarchy. The Babylonian king Nebuchadnezzar defeated Egypt at Carchemish in 604, and Jehoiakim became a Babylonian subject. The prophet Jeremiah counseled submission to Babylon, but in 598 B.C.E. Jehoiakim rebelled. He died soon thereafter with Jerusalem under siege. His son Jehoiachin (597) held out for three months and then surrendered. He and his entire court, including leading figures of the priesthood such as the future prophet Ezekiel, were deported. Babylon now placed on the throne Josiah's third son, Zedekiah. Jeremiah, still in Jerusalem, again urged cooperation with the Babylonian power, which he saw as God's chastising agent for Judah's sins; but other prophets urged boldness against the foreign enemy (Jer. 28-29). Once again the Judeans rebelled. The Babylonian army marched to the gates of Jerusalem, the city was taken in July, 586 B.C.E., and the leaders of the rebellion were put to death. The Babylonians blinded Zedekiah and brought him captive into exile with a large number of his subjects. They also set fire to both the Temple and city of Jerusalem. Thus ended the royal house of David and the kingdom of Judah. While the above summary of the history of Judah deals with the military and political vicissitudes of its course, the biblical account presents a story in which Judah's rise and fall relates to one central theme: its fidelity to God. In this version of Judah's story, the division of the Solomon's United Kingdom is due to the fact of his idolatry and is predicted by the prophet Ahijah long before the northern rebel Jeroboam confronts Rehoboam over Solomon's oppressive labor policy. Thereafter the kings of Judah prosper in war and peace when they "walk in the ways of [their] father David" and eschew to "sin of Jeroboam" (1 Kings 12:29-30). This sin was not his rebellion against the anointed king, Rehoboam, for that had been prophesied and even endorsed by God through Ahijah (1 Kings 11:31). Instead, it was his toleration of idolatry, his endorsement of the "high places" presided over by non-Levite priests, and especially his establishment of the royal temples at Dan and Beth-El, the latter only a few miles north of Jerusalem. In these sanctuaries he reportedly erected golden statues of bull calves. Several Judean kings receive praise from the biblical writers, but even the good kings who destroyed the temples of Baal and tore down the "Ashera poles" did not go far enough, for they failed to destroy "high places" where unauthorized priests operated. Even in the capital, the idea that God alone should be worshiped failed to take root. Jerusalemites worshipped the bronze serpent of Moses (2 Kings 18:4). Families honored Astarte, the Queen of Heaven, by baking cakes and making drink offerings to her (Jeremiah 7:18). Male shrine prostitutes operated not only outside of Jerusalem, but even in the Temple itself in Josiah's day (2 Kings 23:7). So confused was the spiritual consciousness of the Judahites that the God spoke through Jeremiah to characterize human sacrifice as "something I did not command, nor did it enter my mind" (Jeremiah 7:31). In the end, says the bible, Judah was not pure enough to stand in God's sight. Not even the radical reforms of King Josiah could save Judah from its fate. It must be chastised, its temple destroyed, and its people taken into exile. Only then would the Jews — for thus would the people of Judah be called henceforth — be allowed to return to Jerusalem, rebuild their Temple, and await the coming of a true king, the Messiah, the son of David. Bible critics hold that the sacred history summarized in the above section is the product of a religious ideology that emerged several centuries after the facts it describes. An accurate history of Judah and Israel, if possible at all, must be painstakingly distilled from this magnificent work of religious historiography. Tools such as literary analysis, archaeology, and historical comparisons to other documents or events yield a picture that sometimes confirms the biblical view but often contradicts it. Quoting Sennacharib of Assyria: "Because Hezekiah, king of Judah, would not submit to my yoke, I came up against him, and by force of arms and by the might of my power I took forty-six of his strong fenced cities...Hezekiah himself I shut up in Jerusalem, his capital city, like a bird in a cage. Then upon Hezekiah there fell the fear of the power of my arms, and he sent out to me the chiefs and the elders of Jerusalem with 30 talents of gold and 800 talents of silver, and divers treasures, a rich and immense booty." The invasion of Judah by Sennacharib of Assyria provides a good example. The Bible briefly admits (2 Kings 18-19) that Sennacharib succeeded in conquering much of Judah. However, it goes on at some length to describe God's miraculous intervention to save Jerusalem by sending a mighty angel to smite the Assyrians with a plague. The story told by Sennacherib himself in the "Taylor Prism," discovered in the ruins of the city of Nineveh, is quite different (see sidebar). Historical critics of the Bible tell us that much of the biblical history of Judah is colored so as to portray religious issues as paramount. It is replete with legendary and mythological material, as well as being highly biased toward the viewpoint of the Yahweh-only religious faction in Jerusalem. It exaggerates the wickedness of "Canaanite" religion, unfairly denigrates the Northern Kingdom, and favors the priestly elites of Jerusalem at the expense of their geographical and religious competitors. Feminist critics add that this portrayal of Judah's history arises from male chauvinist writers who sought to repress women in general and goddess worship in particular. Various critics argue that the biblical writers' justification of repressive policies toward other ethnic and religions groups is not better than the attitude of modern-day militant Muslim sects. Recently an intellectual movement has arisen to link Judean biblical attitudes with alleged Israeli cruelty toward the Palestinian people. Many historians, of course, refrain from such moral judgments against biblical standards, pointing out that the ethical values of today cannot be imposed on ancient societies. Finally, a large number of Christian and Jewish scholars accept some of the findings of historical criticism regarding the Kingdom of Judah but insist that the contribution of Ethical Monotheism to civilization outweighs the negative aspects mentioned above. The following chart presents a timeline of the Kings of Judah. For this period, most historians follow the chronology established either by William F. Albright, Edwin R. Thiele, or Gershon Galil, all of which are shown below. All dates are Before Common Era. 598 598 598–597 B.C.E.|597 Jehoiachin(Jeconiah) Yehoyakhin ben Yehoyaqim, Melekh Yehudah Deposed after Jerusalem falls to Babylon. History of "Kingdom of Judah"
This page was last modified on 17 December 2018, at 20:29.